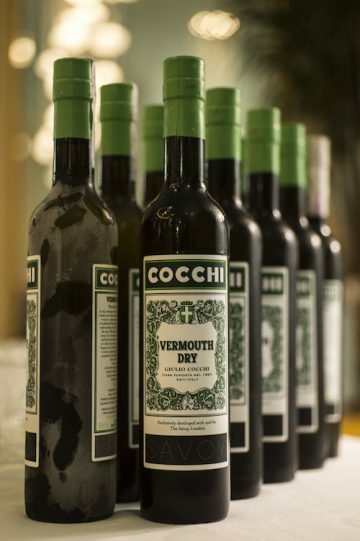 Many months in the making, we are proud to finally reveal the results of a one-of-a-kind partnership between London’s most iconic hotel, The Savoy, and the much beloved, boutique vermouth producer Giulio Cocchi. The Savoy Dry Vermouth has been created to provide an inimitable backbone to the American Bar’s famous Martini Cocktail, while its masterly composition also allows this beautifully distinct dry vermouth to be enjoyed chilled or over ice to equal delight. Produced in very limited quantities, this first expression of the joint venture between The Savoy and Giulio Cocchi will be available for purchase at The Savoy and from its renowned American Bar from 1st November 2014. To launch this exceptional new addition to the American Bar’s portfolio, we will be welcoming Martini-lovers from all over the world during London Cocktail Week, between 6th and 10th October, to try this ‘Savoy’ take on the Classic Martini Cocktail for the first time. SAVOY DRY VERMOUTH – In 2014, boutique vermouth Piedmontese producer Giulio Cocchi and London’s most famous hotel, The Savoy, have collaborated to create a unique expression that is the combination of traditional Italian wine making skills and the profound understanding of mixology from The Savoy’s American Bar team. Although a rare and unique composition, Savoy Dry Vermouth, through the use of wormwood and bitter botanicals, is true to the signature flavours of a classic dry vermouth but is enriched with citrus, bergamot and alpine herbs from Piedmont region to create a pleasantly dry backbone for this beautiful aromatized wine. While delicious served on its own, either well chilled or over ice, The Savoy Dry Vermouth is the perfect supporting partner in the most beloved cocktail of all times, the Martini. Enjoy this inimitable vermouth while limited stocks last. SAVOY AMERICAN BAR – The term “American Bar” refers to a bar serving mixed or “American” style drinks, more commonly known as cocktails. As transatlantic travel became more popular in the late 19th and early 20th Centuries, many American Bars opened throughout London. The American Bar at The Savoy is the longest surviving of these bars and one of the most iconic cocktail bars in the world. In 1903 the first truly ‘famous’ bartender arrived at The American Bar, a lady named Ada ‘Coley’ Coleman, who’s signature cocktail was the Hanky Panky, still a popular choice today. Ada’s successor was the inspirational Harry Craddock, who not only created a number of classic cocktails but who notoriously compiled these recipes into the legendary Savoy Cocktail book, still regarded today as the bartender’s bible. Following The Savoy’s restoration, the American Bar appointed its eleventh head bartender, Erik Lorincz. A world-renowned bartender himself, Erik was officially recognized as such in 2011 when he was awarded Best International Bartender at Tales of The Cocktail. The American Bar itself also picked up World’s Best Hotel Bar at these same awards as well as Best Bar in the Virtuoso Best of the Best Awards. And as further testament to the talent found within the American Bar, bartender Tom Walker was most recently crowned World Champion of the Bacardi Legacy Global Cocktail Competition 2014 with his creation, the Maid in Cuba.